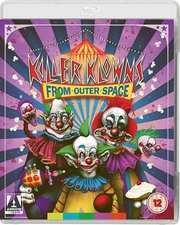 Killer Klowns From Outer Space is a classic, cult horror/comedy from 1980s. The town of Crescent Cove is invaded by a Big Top which is discovered by couple Mike and Debbie. Inside are evil Killer Clowns looking to capture humans in cotton candy for food. Escaping they inform the police which consists of Deputy Dave (Debbie's ex) who is sceptical but wants to help and Deputy Curtis who is sceptical and doesn't. The Klowns start to cause chaos, killing and capturing the people of the town, before Dave finds their weakness and looks to destroy them all before they cocoon the entire town. I loved this film when I was a kid. I remember seeing the poster in my local video shop and begging my Dad to rent it and I was blown away by how insane and crazy it all was. The effects were fantastic and I did worry that watching it in clear HD quality would mean that I would see all the archaic flaws that I wouldn't have seen as a kid. Instead, I was surprised by how well the practical effects and costumes hold up. I expected to laugh at the effects and how cheesy it all looked, but I didn't. It still looked as effective and creepy as it did in 1988. If you haven't seen the film before then you may laugh at the acting, as some of it is terrible, but I still found a charm to the way it was all put together. Unlike most films, it suits the nature of the film and I don't think Academy-Award winning acting would suit a film of this nature. That being said, I still loved the whole feel of the film and the nostalgia kick was perfect throughout. The disk is jampacked with extras and this is simply wonderful. Every aspect of this film is looked at from the effects to the music. There is nothing missing and anything that is not talked about most definitely is covered by the very entertaining commentary featuring all three Chiodos Brothers. Let the Show Begin! Anatomy of a Killer Theme Song looks at the theme song creation by members of the band The Dickies. The only issue I have is that as the main screen plays a twenty second segment of this on a loop after a few minutes you start to hate what on first or second listen is a harmless and enjoyable song. The Chiodos Walk Among Us is an odd feature that highlights the work of the Chiodo brothers making Super 8 films. If you are an aspiring film maker especially in the fantasy genre then this may interest you. Also included are six of the films which are interesting to see how they developed as film makers, but none are worth watching more than once and it is a shame that they didn't go back and add any sound to them as it would make them easier to watch. Bringing Life to These Things is basically a tour of Chiodo Bros. Productions office which has it's moments, but I'm not sure what it was trying to achieve beyond showing how important real effects are over CGI. The Making of Killer Klowns is a great interview with all three Chiodo brothers. This coupled with their commentary shows just how much effort and love went into making this film and it is a shame that they are not as well known as someone like Stan Winston in regards to visual effects. Behind the Screams is a mix of archive footage that most had already been used looking in-depth at the creation of the film just from archive footage rather than modern reflections. Some of the footage is interesting, but most been recycled from other extras. Klown Auditions is less than four minutes of people trying the Klown outfits on and showing what they can do. Not really sure if this is an audition or more teaching people how to act and move in the costumes. Killer Bloopers is less than three minutes of mistakes from the making and they are not really funny more just technical mistakes. This is a shame. Same with the two Deleted Scenes which were not great and even the alternate commentary seems to imply they were not necessary or technically didn't work. Image Galleries is a nice mix of Stills, Behind the Scenes, Concept Art and Storyboards. The fact it isn't in the video format is great so you can look at them properly. There are some interesting bits here though I wish the storyboard had a comparison to the filmed version option to see how close they were. Original Theatrical Trailer is great but also shows just how perfect the new transfer of this film is. I can see from the trailer why it was a film I wanted to watch. Killer Klowns From Outer Space is a wonderful piece of 1980s nostalgia. If you have never seen the film I would recommend this to any science-fiction, fantasy, horror or comedy fans. The film ticks so many boxes that it is not surprising that this film got a thirty year anniversary edition and if you were there watching when it first came out (like me) you will rejoice at the memories of the Krazy Klowns once again.